Harkeerat is using Smore newsletters to spread the word online. Use a table of differences to determine whether an equation is linear or quadratic. Graph a parabola using an equation in vertex form. Apply vertical stretch or compression to a parabola when graphing using the step pattern. Determine the equation for a parabola given the vertex and one point. The vertex of a parabola is the highest or lowest point of the curve and can be determined from the equation using the values of h and k where h is the x value of the vertex and k is the y value. The a value is the vertical stretch or compression of the parabola where an absolute value less than 1 indicates a compression while an absolute value greater than or equal to 1 indicates a stretch. When looking at an equation you can use a table of differences to determine whether or not the equation is linear or quadratic. 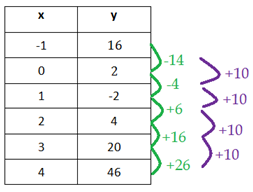 First, fill in some of the x and y values of the equation in to the table. Then make a new column called the first differences (green column in picture below). To fill in the values in this column subtract the first y from the second y in the previous column (2 - 16 = -14). Continue by then subtracting the next pair and then so forth (-2 - 2 = -4). If all of the values in the first differences column are the same then the equation is linear. (-4 - 14 = 10), (6 - (-4) = 10), and so forth. If the values of the second differences are all the same then the equation is quadratic. To sum it up if the first differences are the same then the equation is linear, if the second differences are the same then the equation is quadratic and if neither are the same then it is neither linear nor quadratic. To graph a parabola in vertex form you can use the step pattern. First, however, you must use the values of h and k in the equation to determine the location of the vertex which is the highest of the lowest point of the curve. The value of h in this equation is 4 so the x value of the vertex is 4. Keep in mind that it is not -4 because the negative is already present in the original form of the equation. Next we see that the value of k is -6 so the y value of the vertex is -6. Knowing these coordinates we can now plot the vertex at point (4, -6). Next, we apply the vertical stretch by using the step pattern. In the case where there is no stretch or compression applied, like in the simple equation y = x², the steps are: 1, 3, 5, 7 and so on. This means that from the vertex you go over 1 up 1 unit, then up 3 units, then up 5 units and so on. In the graph below we have to use a vertical stretch of 2 so we multiply each step in the vanilla step pattern by 2 to get the new steps. This results in the steps: 2, 6, 10, 14, and so on. If you are still confused about the step pattern watch the following video which goes through the process of finding the vertex and using the step pattern to graph a parabola. If you're having trouble graphing equations using mapping notation may make it simpler and easier to understand. Finding the equation for a plotted graph is also very simple. First of all, you already have the coordinates of the vertex so you can simply plug them into the equation. Insert the y coordinate of the vertex as h and the x coordinate of the vertex as k.
To find the value of a is not as complicated as you may first suspect. 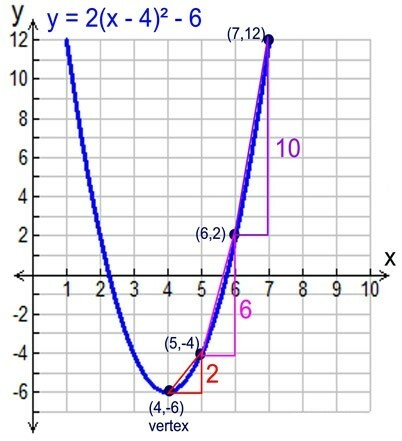 Simply substitute in a point of the parabola by subbing in its x and y values and solve for a.
Q. Determine the equation for a parabola that has a vertex of (2, -4) and passes through the point (-6, -20). Therefore the question for this parabola is y = -0.25(x - 2)² - 4. Simplify expressions using distributive property with the FOIL method. Factor polynomials using common factors and by grouping. Factor simple and complex trinomials using decomposition. Factor using difference of squares and perfect square trinomials. Solve a quadratic equation in factored form. Graph a parabola from the factored form of its equation. The x-intercepts or zeros of a parabola are points that occur when y = 0. The zeros of the parabola defined by this equation can be determined by setting y to 0 and solving for x. Since every parabola has two zeros there are two x in the equation so solving for both of them will give you both zeros. The value of a, like in vertex form, is the vertical stretch or compression that is applied to the parabola. To simplify this equation, you can use FOIL to multiply all of the terms in the bracket. FOIL stands for "First, Outside, Inside, and Last". Following this method, to simplify, first multiply the "First" terms in each pair of brackets together. In this case, the two first terms are both x. Multiplying them together, we get x². Next we multiply the two "Outside" terms together, in this case they are x and -1, which gives us -x. Then we multiply the two "Inside" terms, they are 5 and x, giving us 5x. Finally, we multiply the last two terms, 5 and -1, giving us -5. Common factoring is the simplest and easiest way that an expression can be factored. It is done by factoring out the GCF (Greatest Common Factor) of all the terms. This includes the GCF of the coefficients as well as the GCF of the variables. Whenever you see that there is a GCF between terms in an expression, it is possible to factor it. Finally there is something called factoring by grouping which is can be used when you have a polynomial with 4 terms. It is simply when you factor something out of each pair of terms and then use the above method to factor out a GCF. When faced with factoring trinomials there are multiple methods you could use. The two most popular methods are decomposition and guess and check but I will only be featuring decomposition in this unit summary because I greatly prefer it over the other method and it is the primary method I use. To use decomposition you break down the middle term so that the polynomial has 4 terms and then you factor by grouping. Trinomials can be in one of two forms: simple or complex. A simple trinomial is when the x² has a coefficient of 1 while a complex trinomial is the the x² has a coefficient not equal to 1. If the video below you will learn how to solve both kinds. When factoring there are two special cases that you should keep in mind: difference of squares and perfect square trinomials. A difference of squares case is fairly easy to recognize because it is when there are two terms, one with an x² and the other without a variable. Also, the coefficients of these terms are perfect squares meaning that their square roots are whole numbers. Something that is also very important to remember is that it can only be considered a difference of squares case if the first terms is positive and the second term is negative hence it being a "difference". It will not work otherwise. The second special case, a perfect square trinomial, can be recognized when the coefficient of the first term and the third term are perfect squares. Keep in mind, however, that after getting your answer you must check it so that the middle term is the correct one because it may not necessarily be a perfect square case just because the first and third terms are perfect square. The middle term also matters. Now to check our answer, we know it is correct if two times the product of a and b is equal to the middle term in the original trinomial. In this case two times 2 times 1 is equal to 4 which is the middle term so this factored form is correct. Before we can graph an equation in factored form we need to solve it. To solve a quadratic equation means to find the two zeros of the parabola which can easily be accomplished by setting y to 0 and solving for the two x values. Now to equal 0 we know that either the first multiple or second multiple has to be 0 (since 0 times any number is equal to 0) so we can set each of the multiples up to equal 0 and solve for x. After doing that you get the two zeros which are: (-3, 0) and (3, 0). Therefore we know that the vertex is the point (0, -9). Remember that the vertex falls on the AOS so the AOS is its x value. Now that you know what these points are you simply need to graph them. The following video shows a different example but one that has an a value. It also shows how to actually plot the points on a graph. Factor to find the algebraic expressions for the length and width of the rectangle. Then, if x represents 10 cm, determine the perimeter of the rectangle. Therefore the length of the rectangle is (4x + 3) and the width of the rectangle is (3x + 2). For the second part of the question all we have to do is substitute in the length and width into the equation for the perimeter of a rectangle and then substitute in x as 10. Therefore, if x = 10, the perimeter of the rectangle is 150 cm. Complete the square to get vertex form. Solve using the quadratic formula. Use the quadratic formula to solve word problems. This form of the equation is not as useful as the other two because it doesn't reveal as much information about the quadratic equation. The value of c represents the y-intercept of the parabola but that is all we can conclude just from standard form. In this unit we will be learning about how to complete the square to get vertex form. We already know how to factor to get factored form so it is natural we learn this as well. Converting the equation to vertex form gives us more information because it easily tells us what the vertex of the equation is which cannot be determined just from the standard form. We already know how to get the factored form of an equation by factoring it but we can also derive the vertex form from it as well. We do this to make it easier to get more information on the equation. For example, by factoring it we can easily get the x-intercepts and by completing the square and getting vertex form we can easily get the vertex. The following video provides an example of completing the square to get vertex form. The key points to remember are that a, which is the coefficient of the x² must be equal to one. If it is not, factor out the coefficient from the first to terms. The video below will further explain the quadratic formula and will provide an example of how to use it to solve for the two possible values of x. Remember their are two values of x because their is a plus or minus. Q. 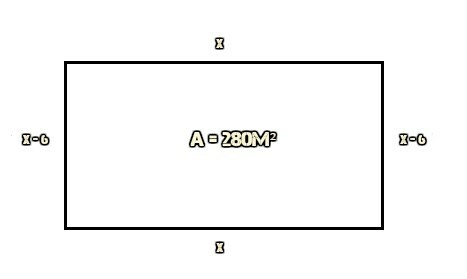 The width of a rectangle is 6 meters less than its length and the area is 280 meters². Determine the dimensions of the rectangle. Let x represent the length of the rectangle in meters. Clearly from the two results the value of x has to be 20. It cannot be -14 because a side length cannot be a negative number so -14 is invalid. Now that we know what the length is we can easily figure out what the width is because it is x - 6 which is 14 meters. Therefore, the length of the rectangle is 20 meters and the width of the rectangle is 14 meters. Everything we have learned in quadratics is connected. The most obvious connection is that we can convert any form of a quadratic equation to any other form. For example, we can get factored or vertex form from standard form. By first converting to standard form, we can even convert vertex form to factored form or factored form to vertex form. Also, any of the three forms of the equation can be used to graph the quadratic relation. When it is in vertex form you can easily graph the vertex and then use the step pattern to determine other points. When it is in factored form you can solve and plot the zeros. Then, you can use the axis of symmetry to solve for the vertex. When it is in standard form you can easily plot the y-intercept which is the third term and use the quadratic formula to solve and plot the zeros. Then you can plot the opposite point to the y-intercept and use the axis of symmetry to solve for the vertex. The following example is one of the assessments I got back in which there were different possible ways to solve for the vertex and to graph the equation. For instance, you could have first used the quadratic formula to get the x-intercepts in question a) but I converted to vertex form first. Either way would have been acceptable and would have gotten the right answer. You could have even factored it to solve and get the zeros. 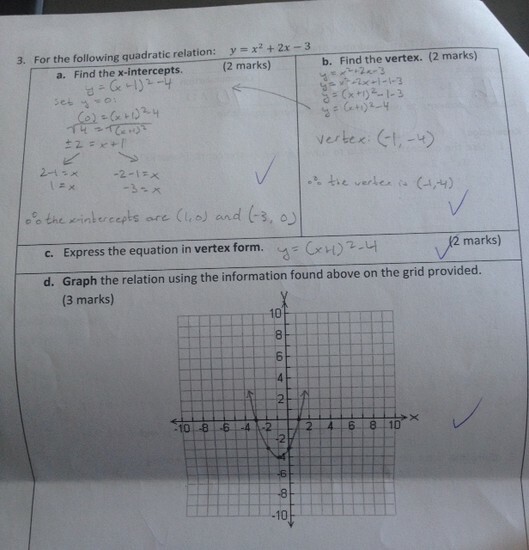 However, in the above example, it was more efficient to complete the square and get vertex form because question b) asks for the vertex and question c) explicitly asks for the vertex form of the equation. If you had used the quadratic formula to get the x-intercepts in question a) you could have subbed in the axis of symmetry to solve for the vertex instead. 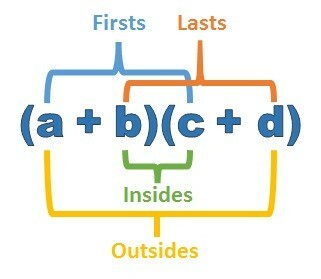 This just goes to shows how all of the different forms of the equation in a quadratic relation are related.